A major role in two top industries: Time says Mulally is a rarity. These aren't happy days for Detroit 3 auto leaders, but Ford's Alan Mulally is sure being lauded and applauded. The former Boeing executive was profiled last week in Time magazine's annual "Time 100" issue, a celebration of "the world's most influential people." His profiler? Microsoft CEO Steven Ballmer. "It is extremely rare for one leader to play a major role in two of America's top industries," Ballmer wrote of the Ford chief. "Alan Mulally is that rare case. As president of Boeing's commercial-airplane business in the late 1990s, he revamped the company's product mix, transformed production and embraced digital technology. In the process, he made Boeing a model for global manufacturing. "Changing industries can upset even the most seasoned executive. Not Alan. ... He has smartly and sensitively made the transition from airplanes to cars." 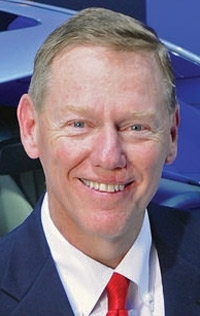 Mulally joined Ford in September 2006 after 37 years at Boeing. By dipping deep into the credit markets before the crunch crippled automotive financing, Ford has escaped the need to beg for government aid -- thus putting some valuable space between itself and ailing General Motors and Chrysler. "I'm rooting for him," Ballmer wrote. "My support is both emotional and rational. My father worked at Ford for more than 30 years."